Oh, you have two Emmys, Claire Danes? Jared Leto, you scored an Oscar? How quaint! Allison Joy "A.J." Langer, who&apos;s best known for playing Rayanne Graff on beloved &apos;90s drama My So-Called Life, has one-upped all of her costars as she lives out a true Downton Abbey life. She&apos;s just become the honest-to-goodness Countess of Devon and a true member of the British aristocracy. Here&apos;s how it happened: The Baywatch alum, 41, met Charles Courtenay by chance while visiting Las Vegas in 2002, completely unaware at the time that he was a British Lord and heir to the Earldom of Devon. (She soon found out.) Though there was some pushback from his family, the two tied the knot in 2005, making the &apos;90s actress a "Lady." With the passing of Courtenay&apos;s father, Hugh Courtenay, on Aug. 18, Charles became the Earl of Devon, which makes Langer his Countess. 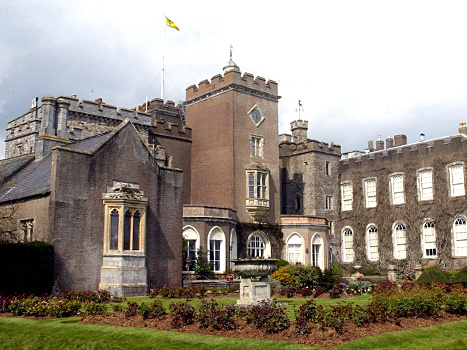 And with a title like that, you best believe there&apos;s a castle—the Powderham Castle in Exeter, England. It&apos;s a 14th-century fortified manor worthy of a PBS special, which sits on an estate boasting 3,500 acres of land right next to the English Channel, about three-and-a-half hours southwest of London by car. Nevertheless, the former small-screen star, who is a mom to little Lady Joscelyn, 8, and Lord Jack, 6, is rather casual about her royal association. Speaking to Breezy Mama in 2009, when she was pregnant with Jack, Langer said, "The whole title thing…I&apos;m no expert," she said at the time. "It means [the Courtenays] have a very big and long family tree. It means more to some people and less to others. It definitely makes for interesting conversation, and an interesting story." She added, "Am I royalty now? No, I am not royalty. We don&apos;t use the titles in our daily lives. They are there and we respect the history that gave rise to them, but in our reality we&apos;re just a normal family."